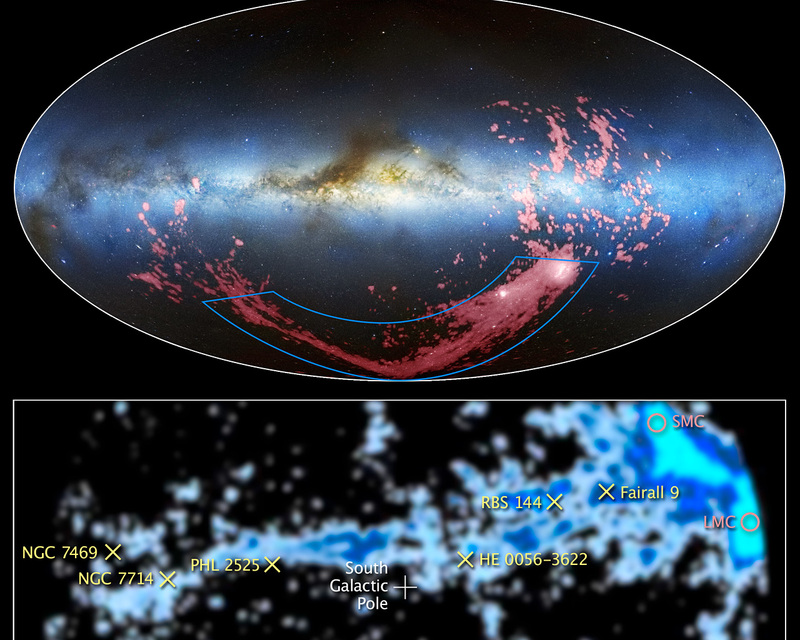 These images show wide and close-up views of a long ribbon of gas called the Magellanic Stream, which stretches nearly halfway around the Milky Way. In the combined radio and visible-light image at the top, the gaseous stream is shown in pink. The radio observations from the Leiden/Argentine/Bonn (LAB) Survey have been combined with the Mellinger All-Sky Panorama in visible light. 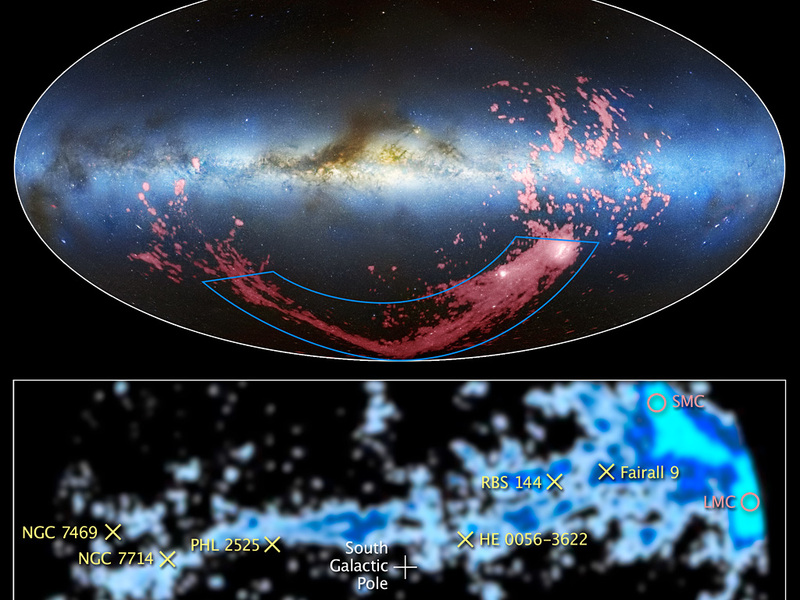 The Milky Way is the light blue band in the centre of the image. The brown clumps are interstellar dust clouds in our galaxy. The Magellanic Clouds, satellite galaxies of the Milky Way, are the white regions at the bottom right. 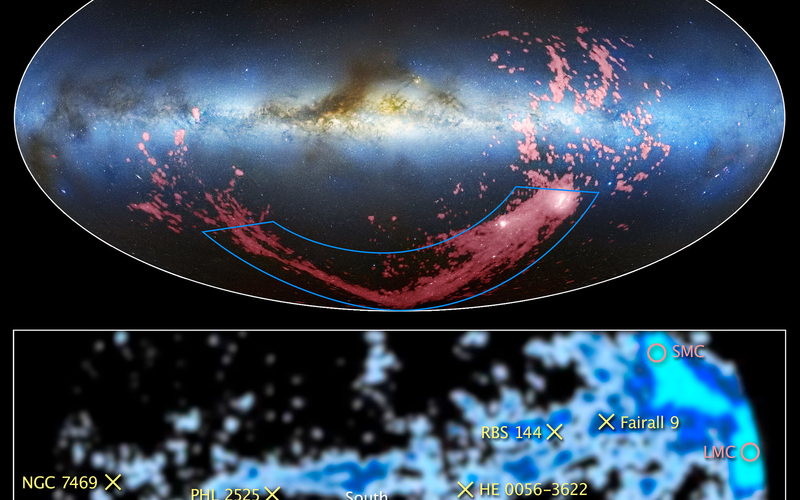 The image at the bottom, taken at radio wavelengths, is a close-up map of the Magellanic Stream that also was generated from the LAB Survey. Researchers determined the chemistry of the gas filament by using Hubble's Cosmic Origins Spectrograph (COS) to measure the amount of heavy elements, such as oxygen and sulphur, at six locations (marked with an "x") along the Magellanic Stream. COS observed light from faraway quasars that passed through the stream, and detected the spectral fingerprints of these elements from the way they absorb ultraviolet light. Quasars are the brilliant cores of active galaxies. These observations show that most of the gas was stripped from the Small Magellanic Cloud about two billion years ago — but surprisingly, a second region of the stream was formed more recently from the Large Magellanic Cloud. 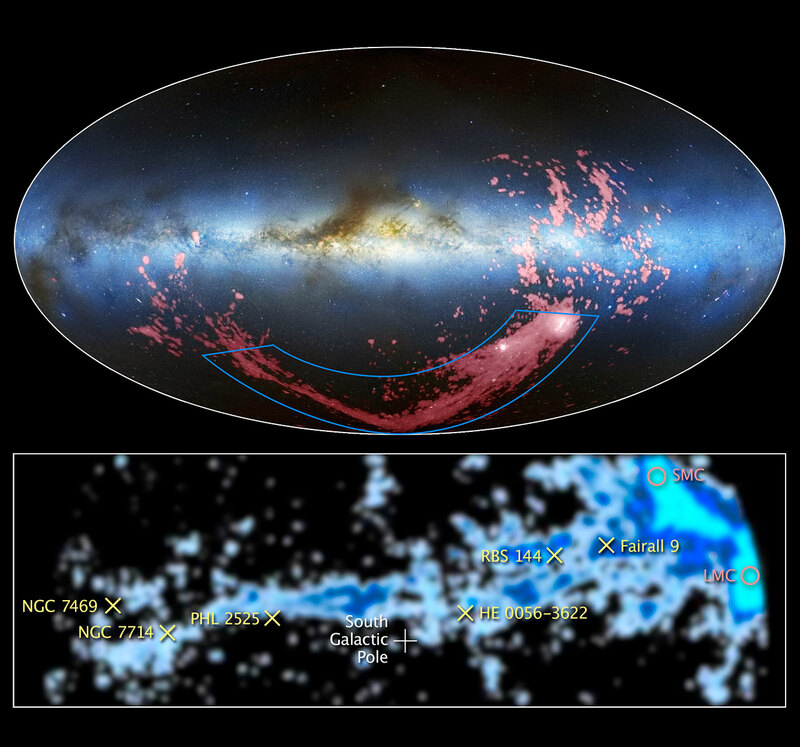 The pink circles to the right mark the location of the Small and Large Magellanic Clouds. Credit for the radio/visible light image: David L. Nidever, et al., NRAO/AUI/NSF and Mellinger, LAB Survey, Parkes Observatory, Westerbork Observatory, and Arecibo Observatory.